On 9 June 2015, H.E. Mr. Khalili, Afghan Ambassador has visited Headquarter of the PS IGC TRACECA for the purposes of discussion latest activities of TRACECA, future vision and plans. On the meeting H.E. 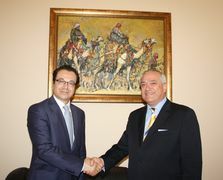 Mr. Khalili expressed his interest to the latest status of accession of Afghanistan to TRACECA. Taking into consideration the Final Resolutions of the 11th Annual Meeting of the Intergovernmental Commission TRACECA and Istanbul Declaration Mr. Ciopraga mentioned that all the Parties expressed their consent on the accession. The final step is official notification of the Ministry of Foreign Affairs of the Islamic Republic of Iran to the address of the Ministry of Foreign Affairs of the Republic of Azerbaijan – the Depositary of the Basic Agreement. facilitating access to the international market of road, air and railway transport and also commercial maritime navigation; ensuring traffic safety, security of goods and environment protection.